Valentine’s Day is something I get more excited about every year. Our family has established a tradition of celebrating the day as a family, staying in for a fancy home-cooked meal of pizza and white chocolate fondue. The kids love it! 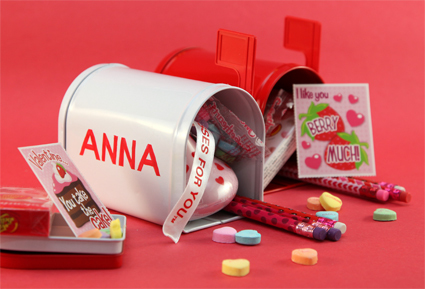 This year I thought I would add some extra anticipation and excitement around the day by giving them these adorable Valentine’s mail boxes. Once a day, I sneak into their rooms and fill them with little surprises, candies and cards. They love to keep watch for the little red flag marker. When they see that it is up, they know there is a new surprise in side. Nothing beats hearing them squeal with excitement from their rooms when they find something new. 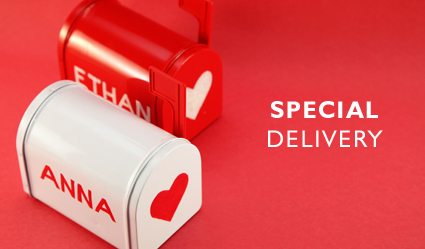 These Valentine’s boxes were from the $1.00 section at the front of Target in just plain red and white. Most of the goodies and Valentines cards were found at a local dollar store, so the whole project for 2 weeks of daily surprises for two kids cost right around $30. Not bad! After considering regular acrylic craft paint, decals or puff paints, I decided that nail polish would have the nicest finish and last the longest through a couple seasons of kid use. To make sure the lettering stayed straight and even, I used masking tape to to section off the area. Then I used a pencil to outline each letter before I attempted to apply the nail polish. I also used masking tape to make the bottom point of the hearts nice and even and centered. The top round parts were done free hand. 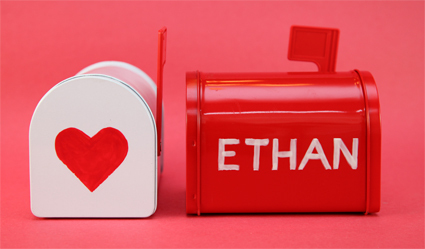 If you are going to make these at home, plan to do 2-3 coats of nail polish for the red on a white valentines box, and a good 4-6 coats for white polish on the red box. Don’t be startled if the first coat comes out looking uneven and bumpy! Let each coat dry for 30 minutes and keep applying. With enough refining, the it will become more even and solid.